The blurb got to me--the idea of a closed-off coach being won over by an 'irritating' woman seemed like a good idea to me. 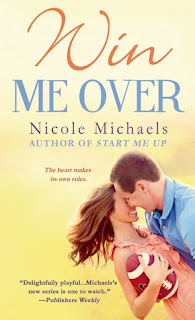 Win Me Over is a sweet, small-town romance that I quite enjoyed. When I read the first book in the series, Blame It on the Mistletoe, for Christmas in October last year, it called to mind all of my fantasies of the holidays in a small town. Well, Win Me Over embraces the football culture that I think permeates a lot of small towns in the United States. One of the things I love about Win Me Over is that it's a very grounded romance. This story could be happening many times over, all across the United States. The pairing of an energetic baker/dance coach with a closed-off football coach doesn't seem unusual to me. With a shared sense of athleticism, strong work ethic, and community spirit, Callie and Bennett are well-matched and make for a believable and shockingly average couple. Now, sure, Bennett had a brief stint in the NFL, and Callie's a former beauty queen. But if you ignore their pasts, I think it's far easier to relate to these two than the normal hero/heroine in contemporary romance. I also liked that Callie and Bennett aren't perfect. While there's lots to admire about them, they have personality flaws, the way that real people do. Frustration, irritation, and being emotionally closed-off are all completely reasonable sources of conflict. There were two details that had me scratching my head. One is that I have no idea how Callie and Bennett fit everything into their day. They've both got so much going on, it seems that they must survive on only a few hours of sleep! The other, more significant issue was that I didn't feel the major conflict was entirely keeping with Bennett's personality. It was such a selfish turn of events that it felt out of line with his otherwise really giving nature. I was able to roll with it, but it did take me out of the book for a moment or two. I really loved Win Me Over. It was sweet, true-to-life, and easy to get myself lost in it. I think it's a fantastic read for the Fall, with everyone headed back to school, the days getting colder. I could see snuggling under an afghan with a mug of pumpkin spice latte, and this book to usher in the season. What is it about contemporary that you don't like? I used to be really anti-contemporary, but in the last five or six years, I've really gotten on board with it. I am with Felicia on this. Reading about people with Cell phones and Ipad's just turns me off. I like small town romance though because things were not as important. Don't get me wrong I have and Ipad and a Cell phone but I didn't when I was romancing my wife. Maybe that's it for me. Romance let's you try and fall backward into character.